Windows thrown open at the charming hotel lobby with bar on the left. 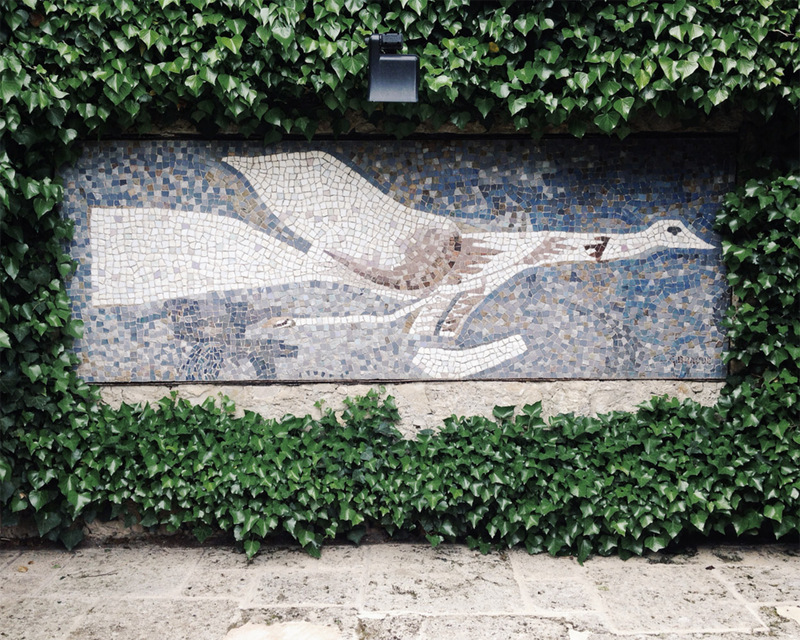 Mosaic bird by Georges Braque executed by Italian painter and mosaicist Luigi Guardigli. 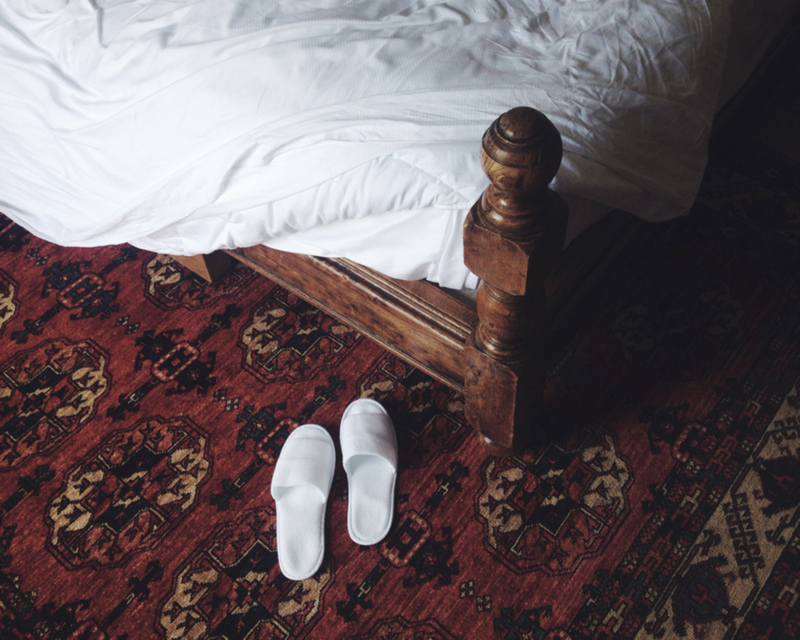 Starting as a three-room inn in the 1920’s, the hotel has been carefully expanded over the years. It was the friendly atmosphere and beautiful, golden light that brought so many artists here in the beginning. The heated pool is lined with turquoise mosaics. Nature and art collaborate as the mobile by Alexander Calder swings in the wind. 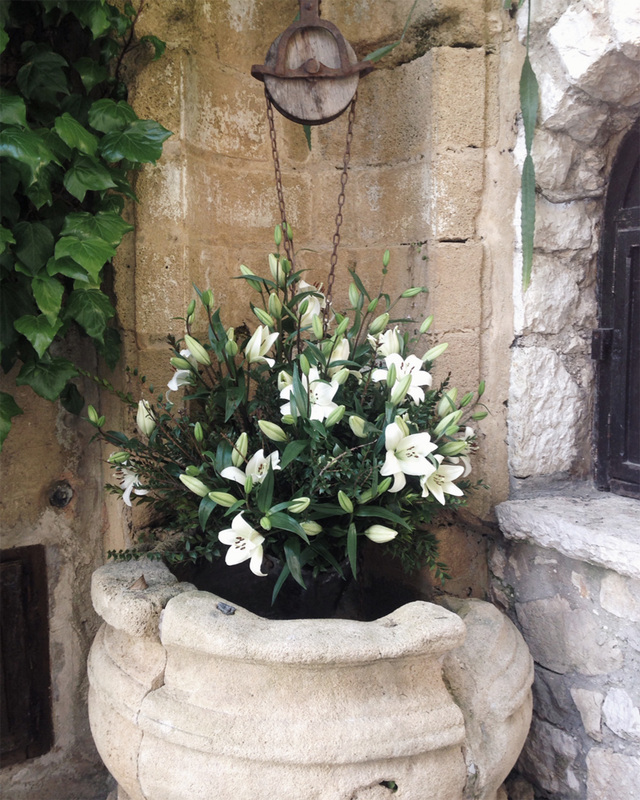 White lilies at the entrance. Closing my eyes, I can easily recall the aromatic scent. …before changing into a bikini and heading down to the pool. Sunrays in the hallway filled with interesting details and pieces of art. I spy a fantastic Picasso vase. 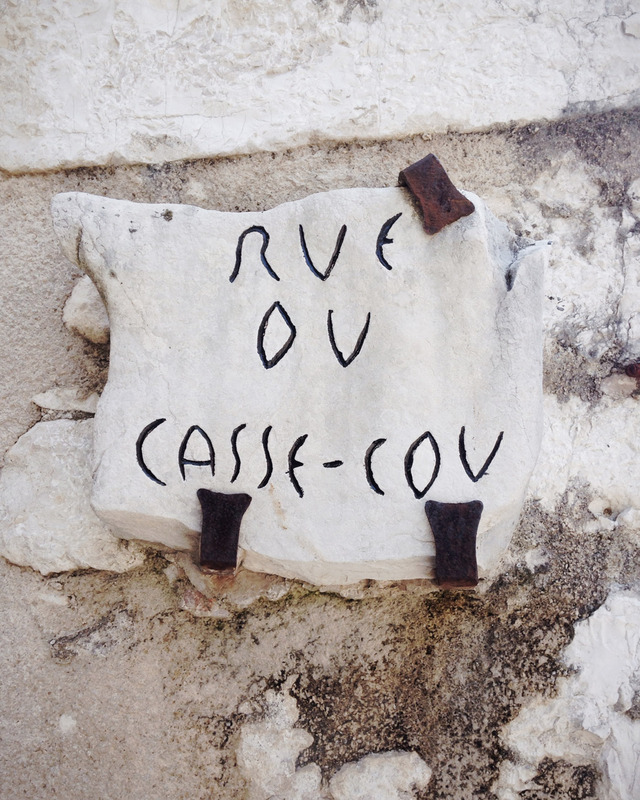 Street signs in the village of Saint-Paul de Vence. 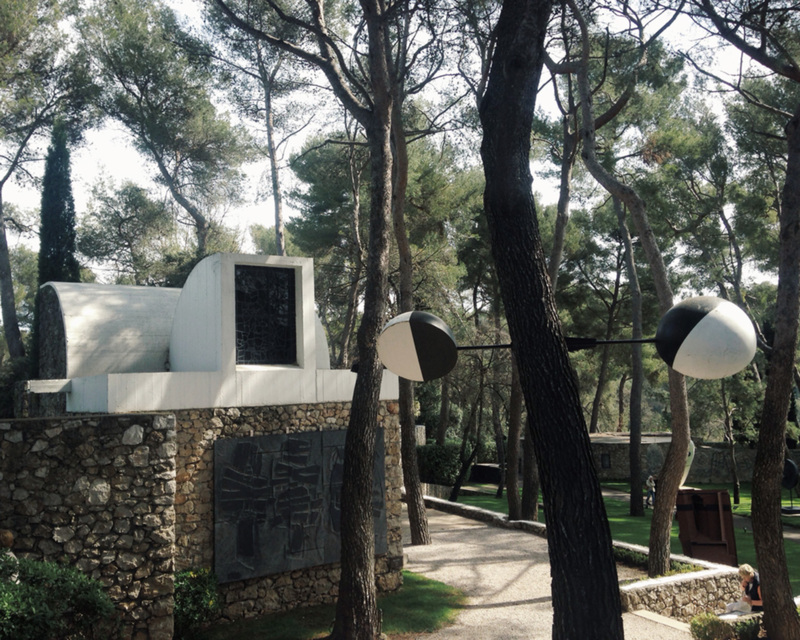 Fondation Maeght was founded by Aime and Marguerite Maeght in 1964 and it has one of the largest private collections of twentieth-century and contemporary art in Europe. Black and white mobile by Greek sculptor Takis, 2005. Designed by Spanish architect Josep Lluís Sert, the museum building itself is a destination, and there are many extraordinary, large-scale pieces installed in the gardens. The arch sculpture is by Joan Miró. 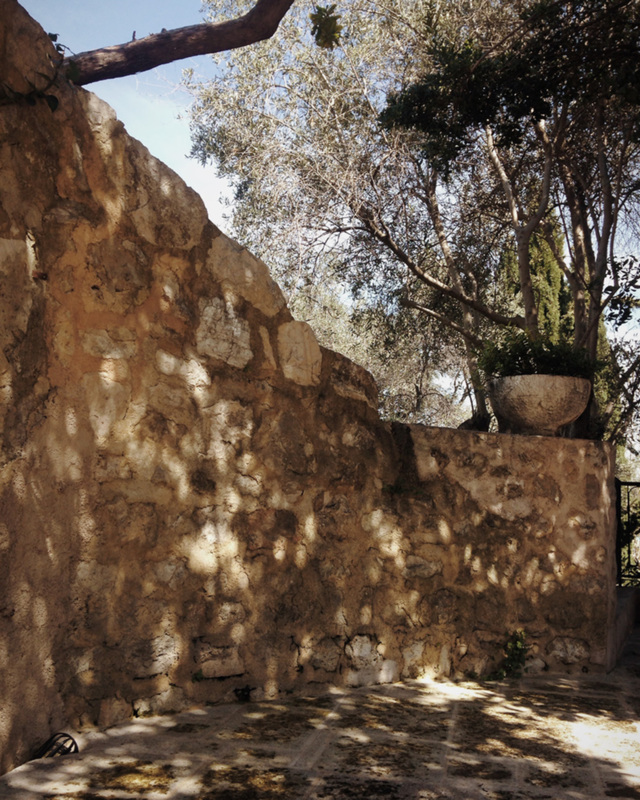 La Colombe d’Or is a small hotel located at the threshold of the village of Saint-Paul de Vence in Provence. It is run by Danièle Noël Roux and her husband, François, whose grandfather Paul set it up in the 1920’s. The place started as a café called Chez Robinson. 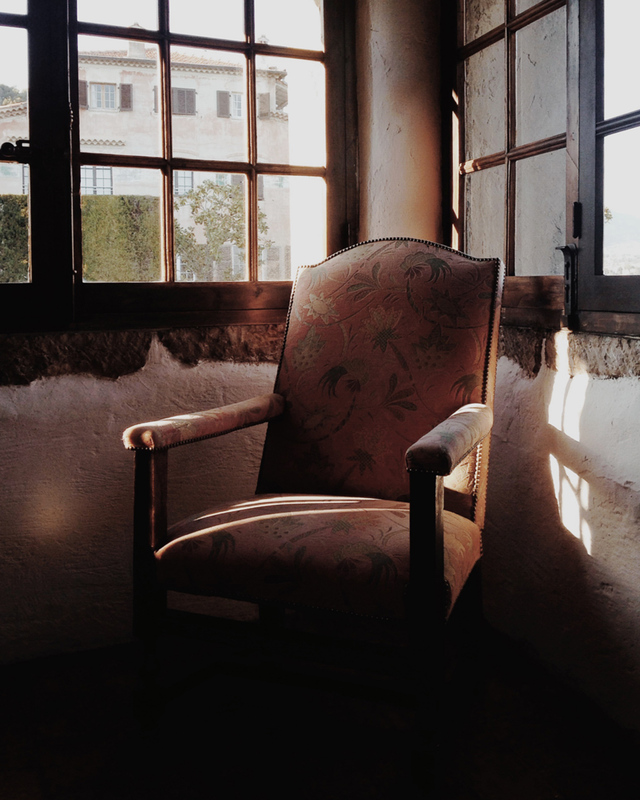 As it quickly became popular among the locals, especially on weekends, it was expanded into an inn of three rooms and renamed La Colombe d’Or, ‘The Golden Dove’. 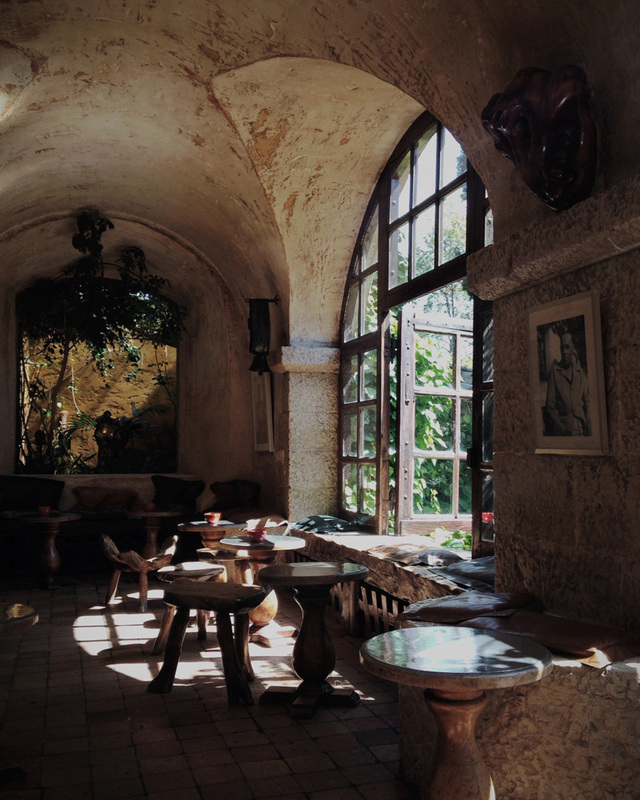 The laid-back atmosphere and the magical light falling on the open-air terrace made La Colombe d’Or an inviting place for local artists to work and dine. The walls were soon covered with paintings – often exchanged for a stay or a few meals. 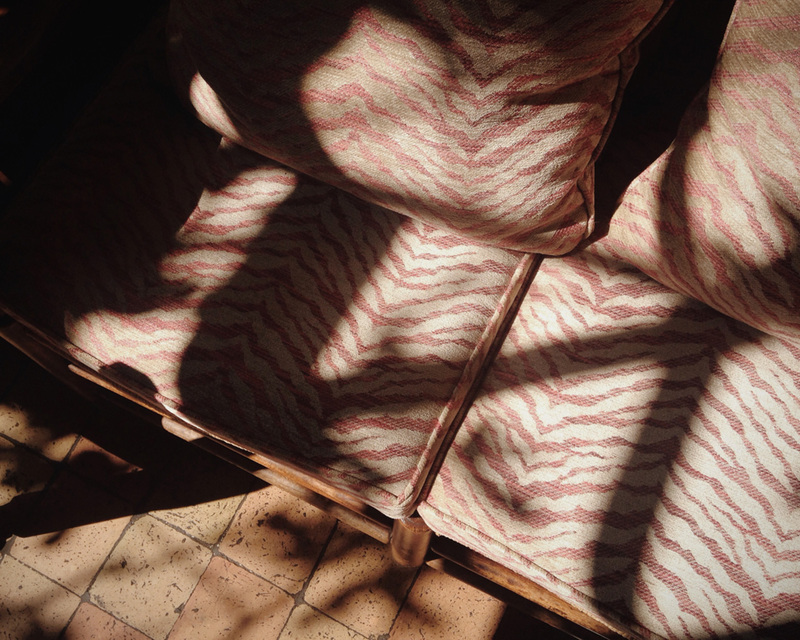 In the 1940’s and the 1950’s the hotel served as a meeting point for various artists and thinkers who came to live and work in Cote d’Azur. Picasso, Matisse, Miró, Braque, Chagall, Calder and César were all regular guests and the art collection of the now expanded hotel grew year after year. 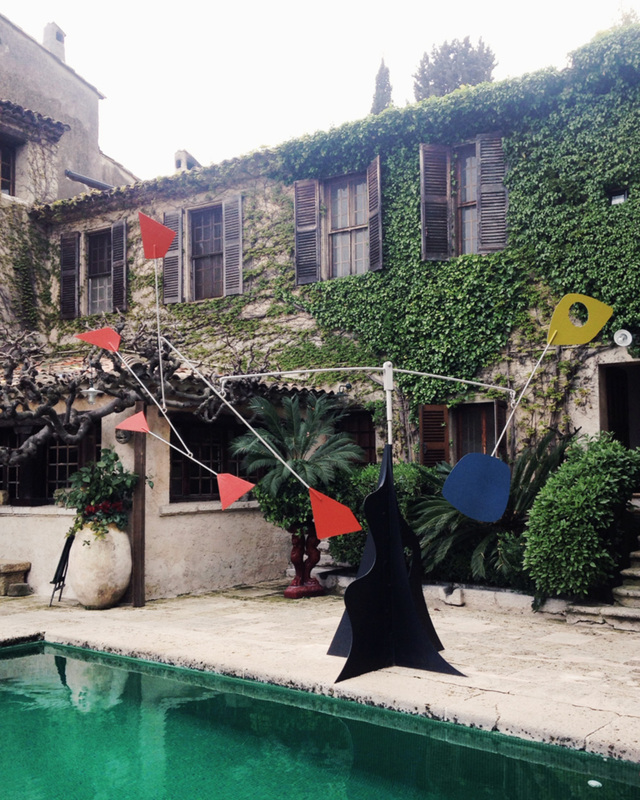 Alexander Calder would send a mobile after each of his stays. The large one by the pool is hard to miss. Other monumental pieces on the hotel grounds include the huge thumb sculpture by César right at the entrance, and the green apple sculpture by Hans Hedberg resting by the pool, beneath the multi-colored roof tiles. Today, La Colombe d’Or has thirteen rooms and twelve suites and an art collection so large that it is rotated like a gallery. The most extraordinary thing as a guest is to live and be surrounded with all that art. Surely there is a security system to protect the pieces but you still enjoy them freely and casually, without your typical museum etiquette. 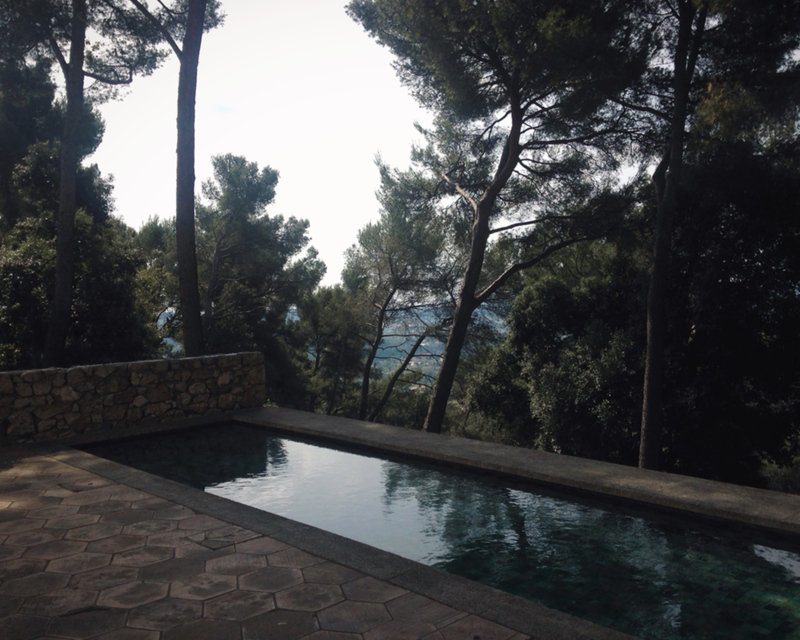 Poolside at La Colombe d’Or, on the first warm days end of April, beginning of May, that is one of the best ways to greet the new season. The pool is heated so a late night dip is a pleasure too. There is not too many popular places in the world that still feel as secluded as this. Visiting the restaurant is a nice experience but, in my opinion, nothing compared to staying in the hotel. 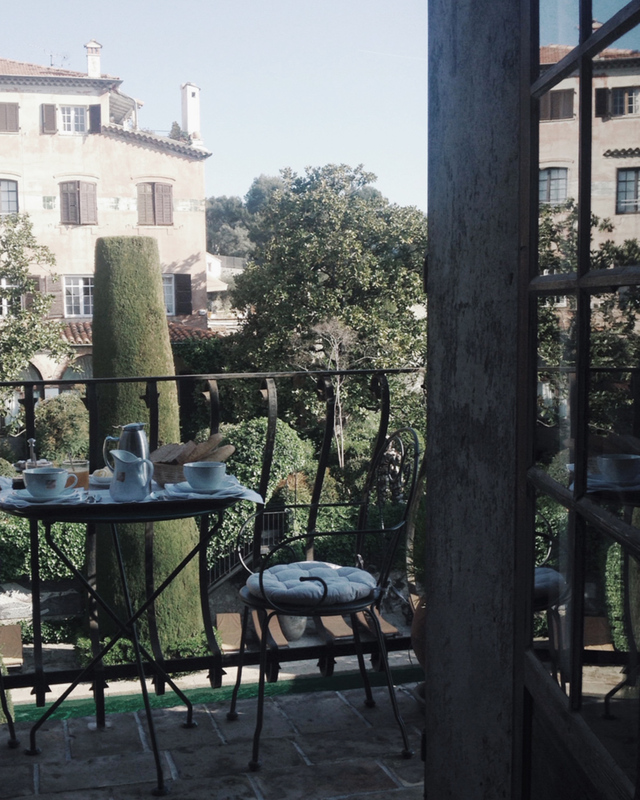 Wake up without the alarm, have breakfast on the balcony – orange juice, coffee with warm milk and freshly baked bread with cold, salty butter – and spend the days reading, daydreaming and enjoying great art. 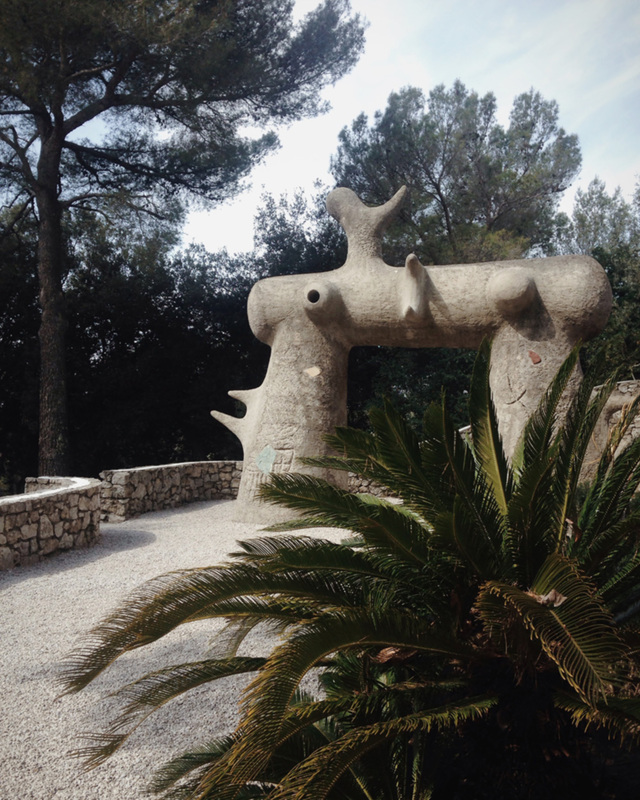 There is a Picasso museum in Antibes but if you have time for only one art visit, Fondation Maeght in Saint-Paul de Vence is a must.